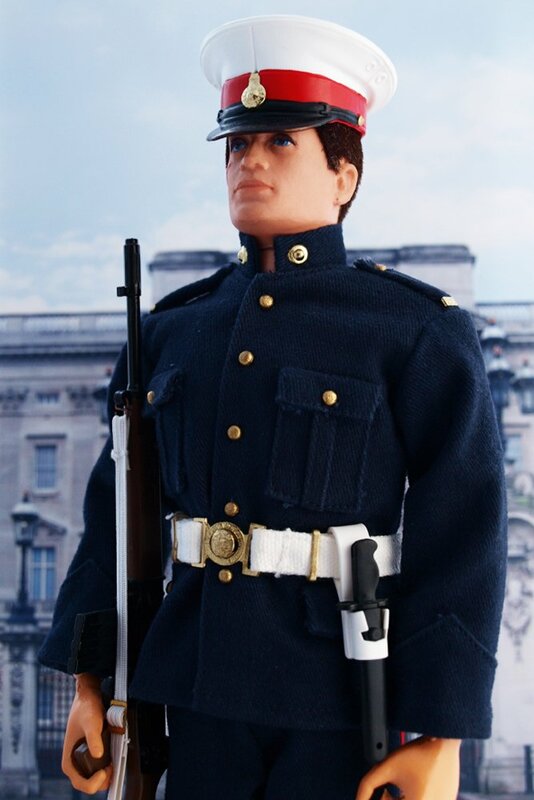 1970-1977 is classed as the Golden Era of Action Man, Palitoy successfully ditched Action Mans American GI look and British uniforms were introduced under the banner ‘Famous British Uniforms’ we saw some beautiful tailored outfits in the form of the ceremonials and also some childhood favourites like the British Para and German Staff officer. 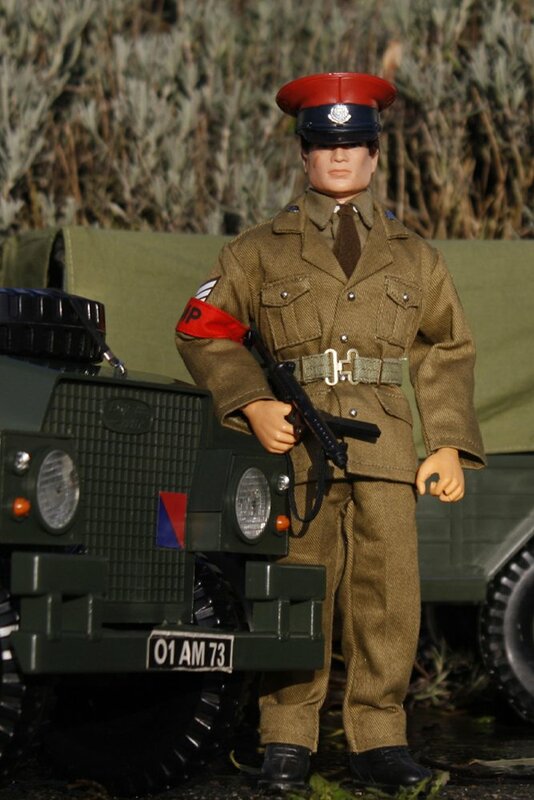 This is the era Action Man took a stand and made himself Britains best loved toy. 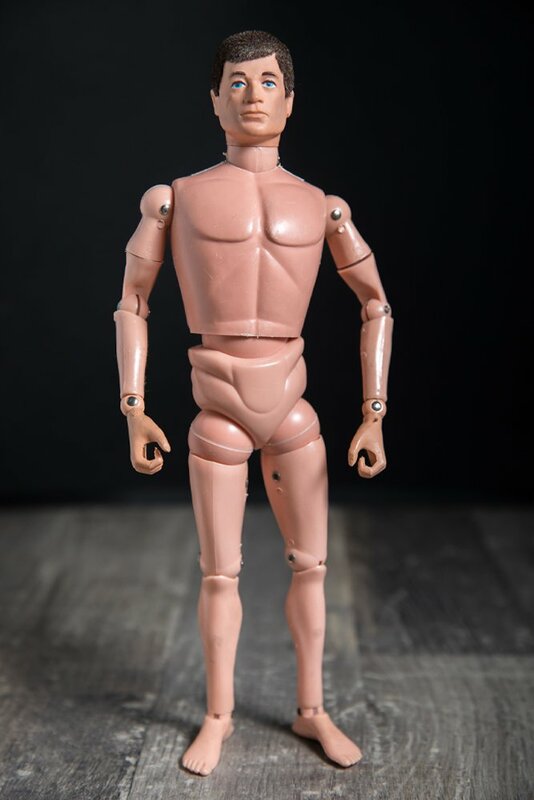 1970, Action Man now with Realistic Hair, that was the tag line for the new and improved Action Man, Palitoy cane up with the idea after watching the ‘flocking’ process on the TV program Tomorrows World where flocking was used on car glove compartments, the technique was soon developed for Action Man. 1973, Gripping Hands. 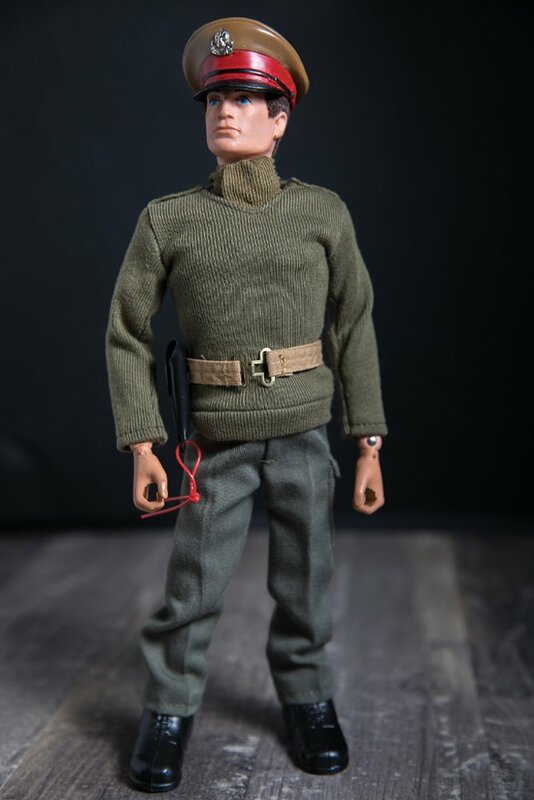 Palitoy liked to innovate and refresh their best selling line every couple of years, one of the biggest problems Action Man faced in the past was holding his kit, This was overcome with new techniques in rubber allowed the design team to sculpt Gripping Hands. 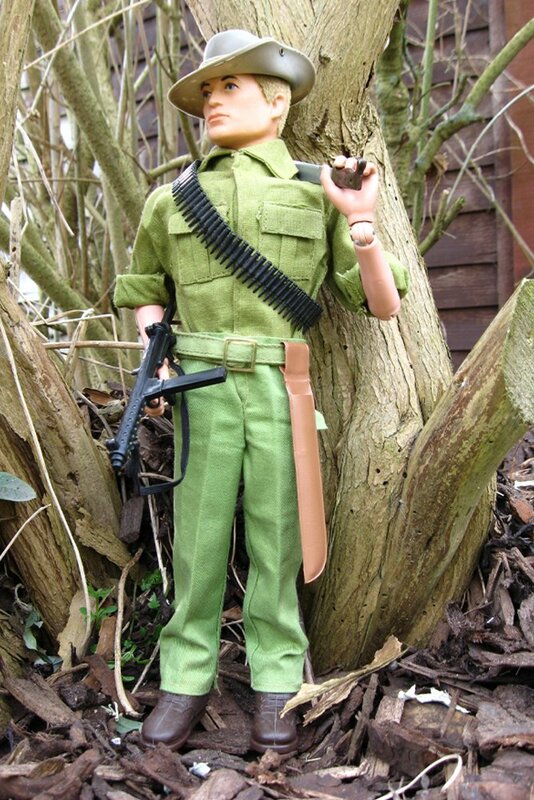 (Kung Fu Grip in the USA) Action Man could hold a rifle, climb and even drink from his cup. 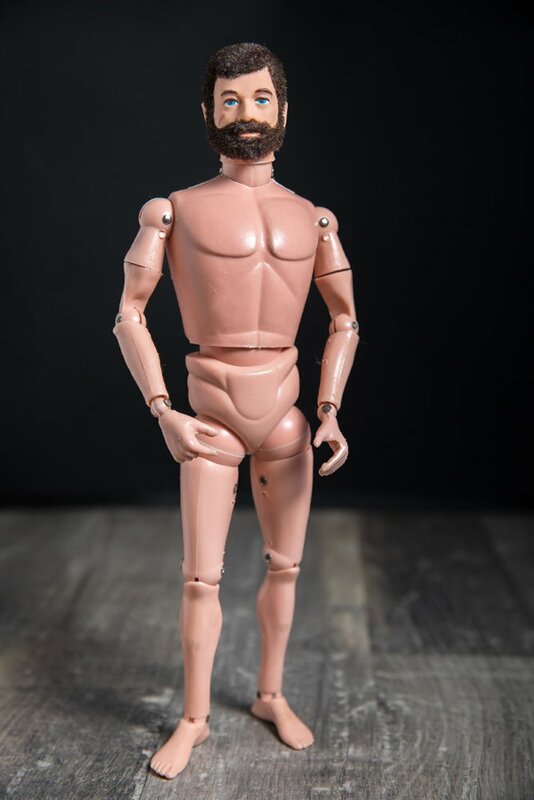 1970, Adventurer, Taking advantage of the new flocking process and wanting to give children a non military figure Palitoy introduced the bearded Adventurer. 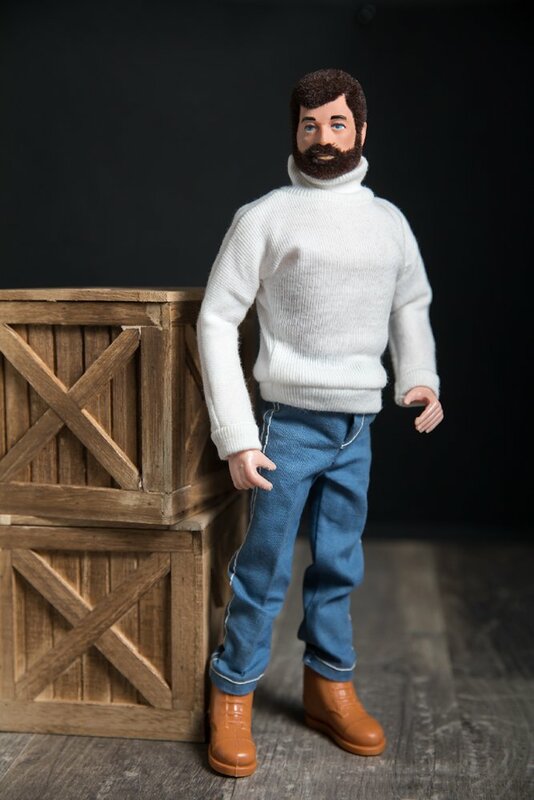 wearing a basic white sweater, dark blue jeans and tan boots, this figure has also been known to be wearing jeans similar to the French Resistance fighter. The Tan Boots and white sweater can prove difficult to find. 1971, Royal Navy Sailor. 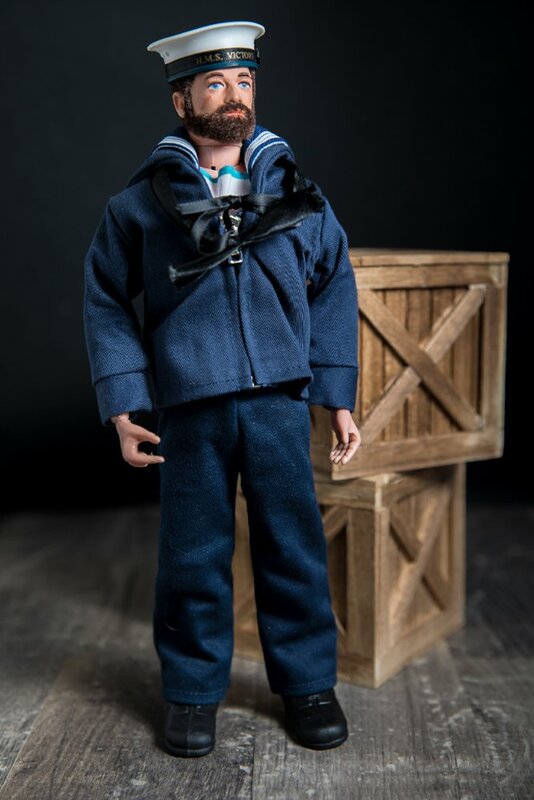 Palitoy opted for a British bearded sailor to separate the gap with GI Joe further, this smartly dressed figure has always been a firm favourite and finding the denims in unfaded condition can be a challenge, as can finding the cap tally with ship name. 1972, 17th/21st Lancers. 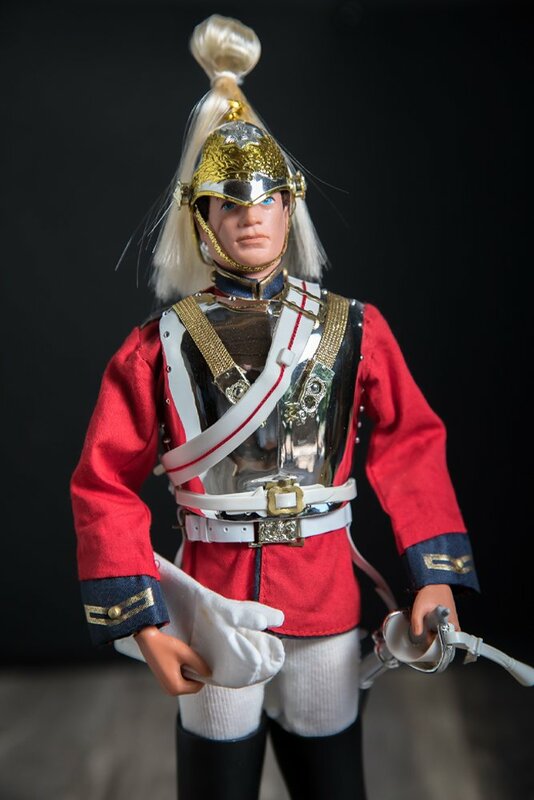 Released as part of Palitoys famous British Regiments series, these highly detailed ceremonial outfits are a jewel in anyones collection, small intricate parts that are easy lost or broken, it a surprise any survived at all. The value of these sets have dropped dramatically within the last 10 years with the introduction of the 40th anniversary, however Vintage mint examples are still very much sought after. 1971, The Life Guard. probably one of the most common of the ceremonial range due to its production run however this does not take away from its collectability, almost identical to the blues, these two outfits together, especially mounted on the ceremonial horse is a sight to behold and it is so easy to see why this is one of the most popular ceremonial uniforms. 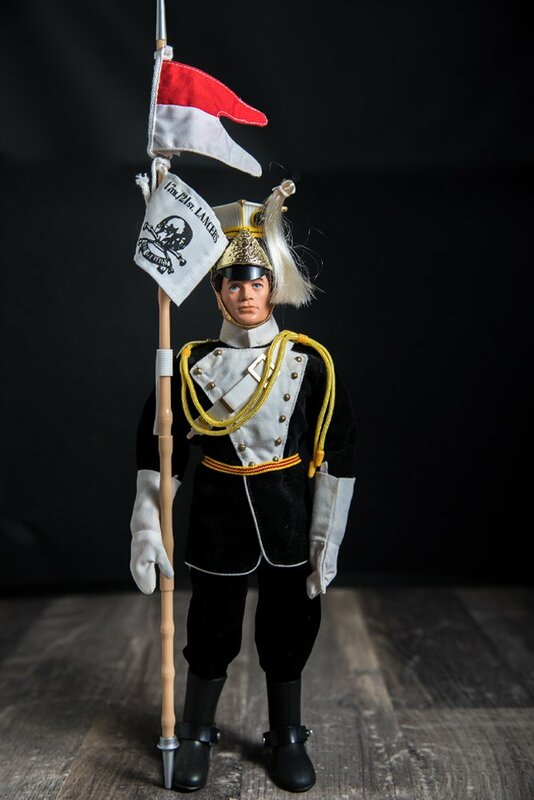 1971, The Royal Horse Guards (Blues) More sought after then the lifeguard and not so readily available, luckily most items can be used with each other as identical, finding unbroken spurs/helmet plume and tunic complete with arm badge can prove difficult. 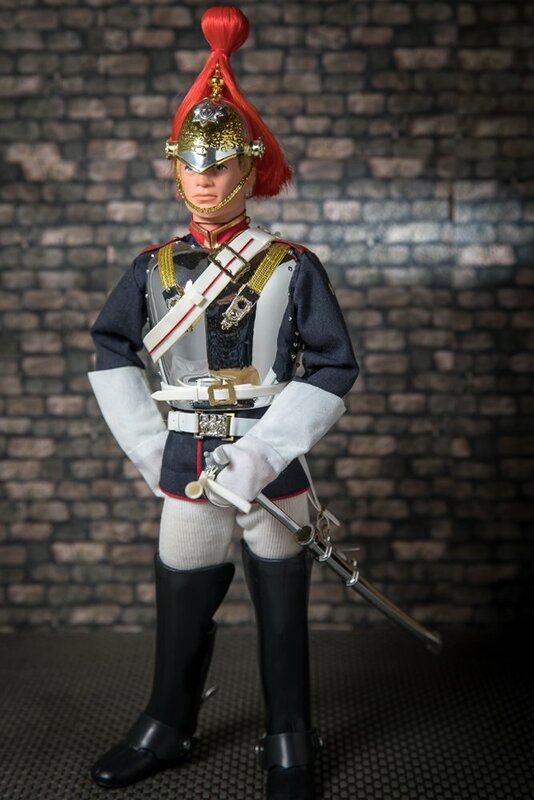 Breast plates have been added to the figure which was sold separately. 1970, Argyle & Sutherland Highlander. 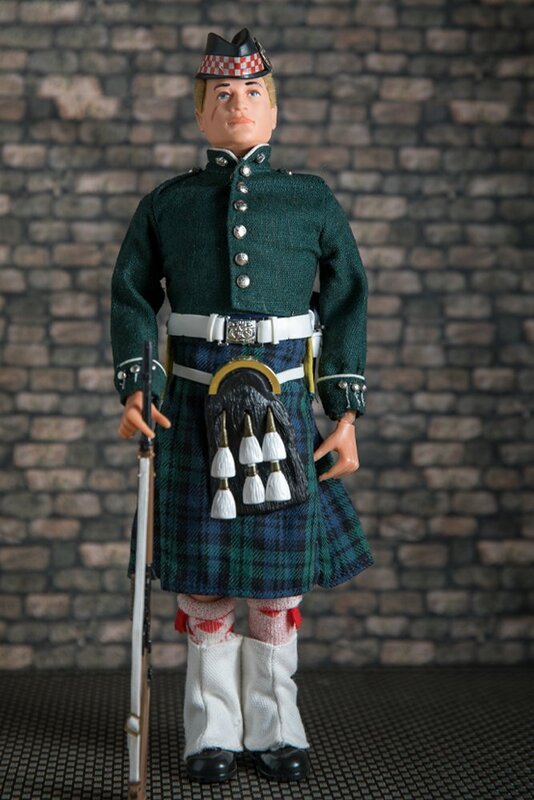 This is probably one of the most intricate uniforms of the whole ceremonial range, breathtaking once complete but finding unbroken examples is a challenge, outfit normally suffers from broken sporran belt, missing cap badge and tally and the frog which houses the bayonet is unique to this outfit. 1971, Royal Marine (No:3 Dress) This dress uniform only ran for 1 year and is very sought after, finding mint matching trousers and tunic can be a problem as can finding the tunic buttons untarnished, simple but very effective outfit, even if you don’t like the ceremonial range many collectors strive to have this example in their collection. 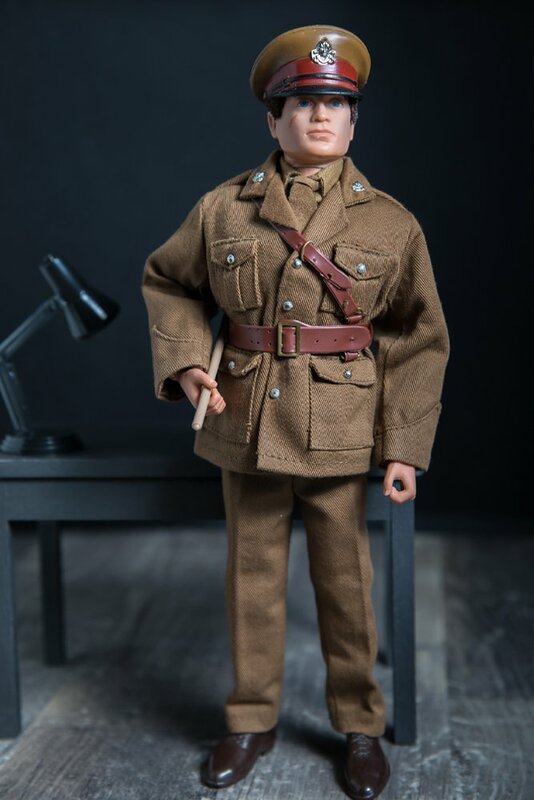 1972, British Army Officer, A very smart looking uniforms and much loved by the collectors, finding an unbroken Sam Browne belt and baton can prove difficult as can finding a good colour match for the tunic and trousers, a later version also exists made of much thinner and lighter material. 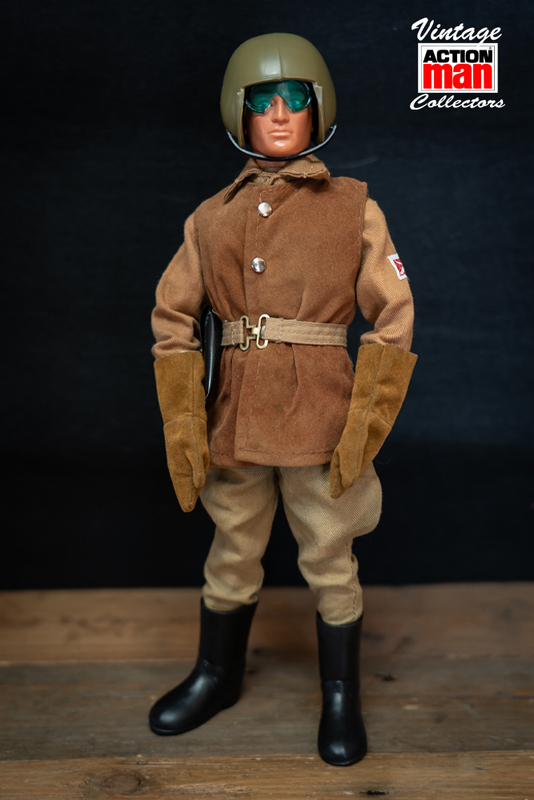 1972, Royal Military Police, very similar to the Army Officer and they complement each other perfectly, Brutus the guard dog goes well with this outfit. not a difficult outfit to track down however the rank stripes are very often missing, a later version also exists with thinner and lighter material. 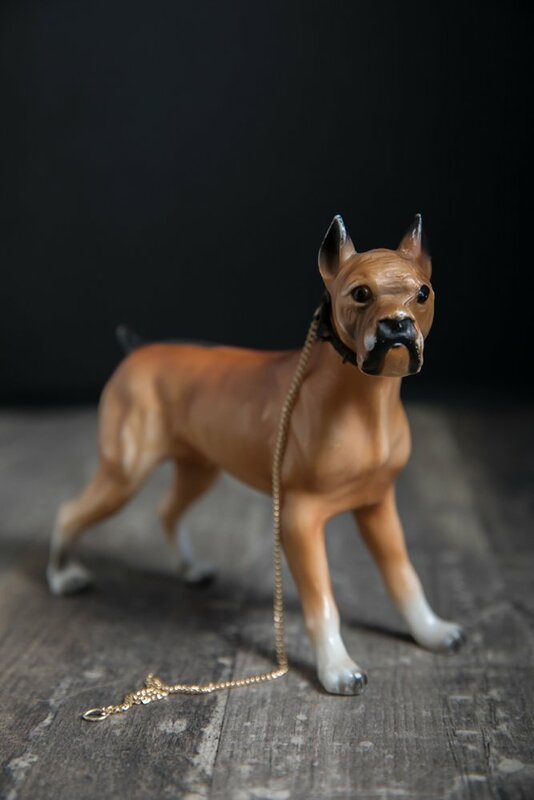 Brutus the Guard Dog, Available only as a mail away item through the star scheme, Brutus the guard Dog is right at home with the Royal Military Police, German Stormtrooper or wherever you feel he belongs. Brutus is quite easy to obtain however finding him with his colour and lead still attached can prove a little more difficult. 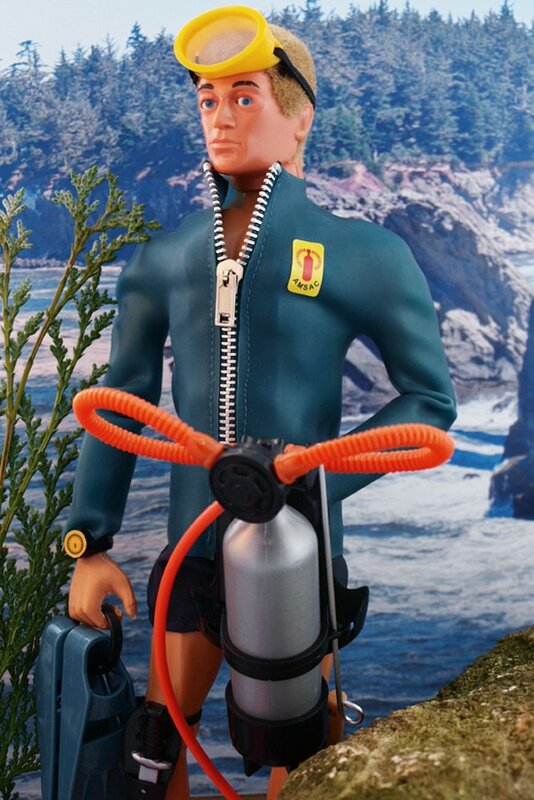 1970, The Underwater Explorer was a very popular outfit which ran till the end of production in 1984. As with all the wetsuits finding the jacket un perished with badge can be difficult, this outfit featured heavily in the commercials of the time and that probably helped its success. The outfit is pictured here with a later Eagle Eyed Dynamic Physique figure. 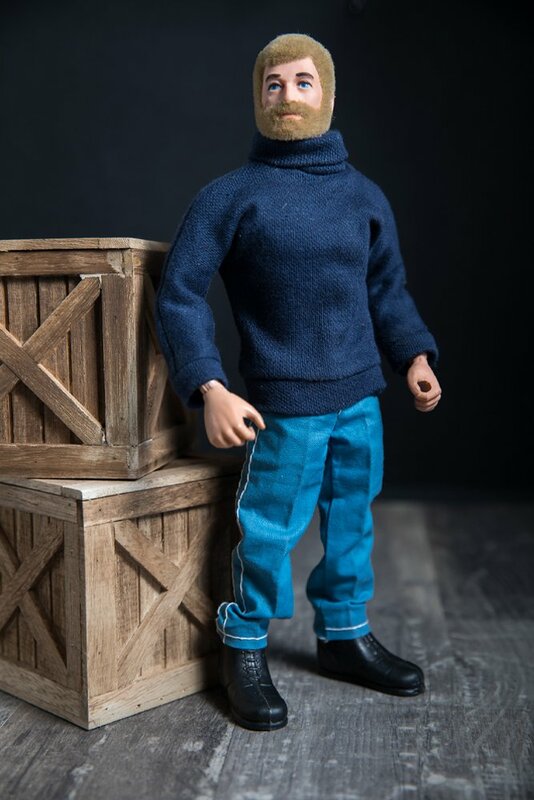 1973, Adventurer, Now with Gripping Hands and a whole new outfit, the white sweater was replaced with blue and the jeans got lighter, standard black boots replaced the previous Tan ones and although materials changed in the later issue the outfit design remained the same from here on out. A very easy and common figure to complete mainly because of its unchanged design. 1973, Talking Commander This would set the standard for all Talking Commanders to follow and would deviate very little from this outfit design. This version gave 8 random commands, finding one with a good clear voice box can be a challenge. 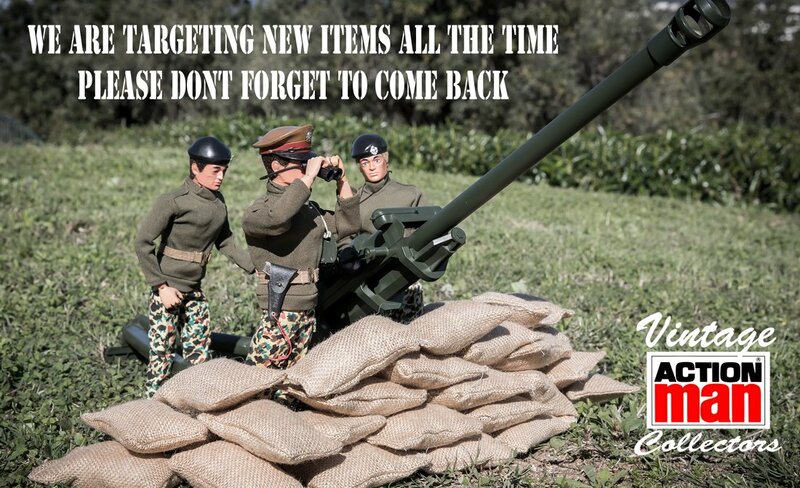 the outfit is common and the talking commander is usually one of the first figures a collector puts together. 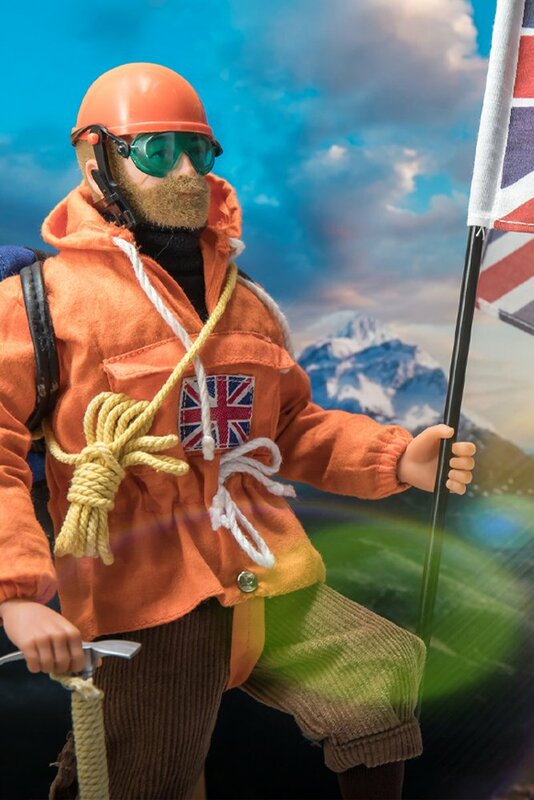 1973, Mountain Rescue replaced the Mountaineer, now with a robe ladder and suction cups to add to the play value, most collectors team the adventurer up with this outfit as it was intended to be none military. 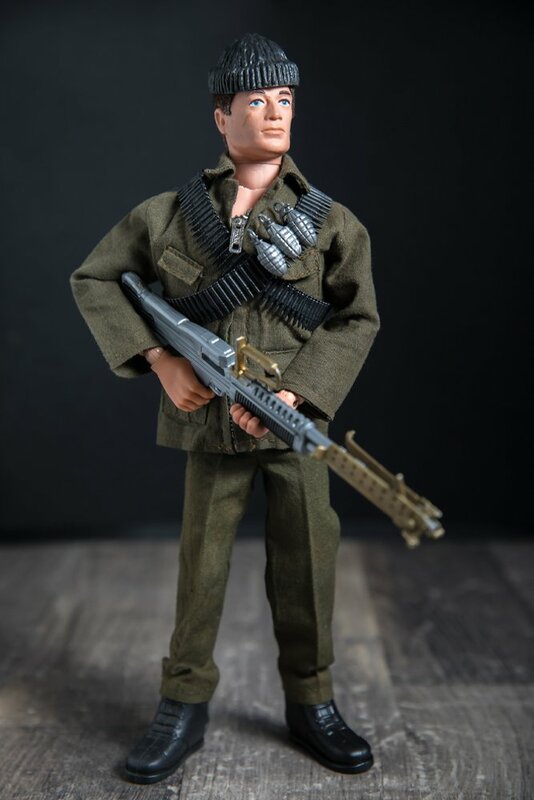 1973, Australian Jungle Fighter, This outfit replaced the original Australian Jungle fighter with a more lightweight outfit, the flame thrower was still included but he was now also armed with a Sterling Sub machine Gun and ammo belt. This ran right up to the Eagle eye period and can still be found easily. 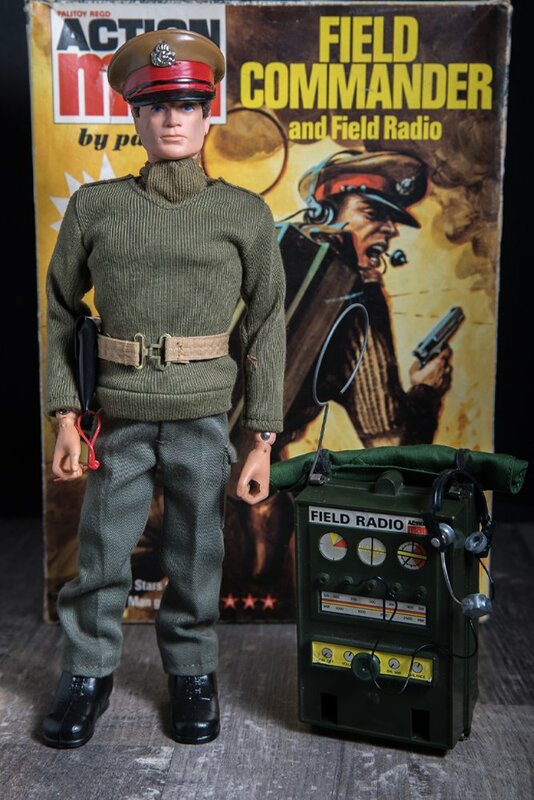 1974, Action Man Field Commander, This large boxed set came with a non talking action man dressed in the Commanders outfit, however the battery operated field radio used small records to simulate orders, this set was only available for 2 years, on a personal note this is the very first Action Man I received as a child. Boxed examples can still be found today however the radio usually does not work. 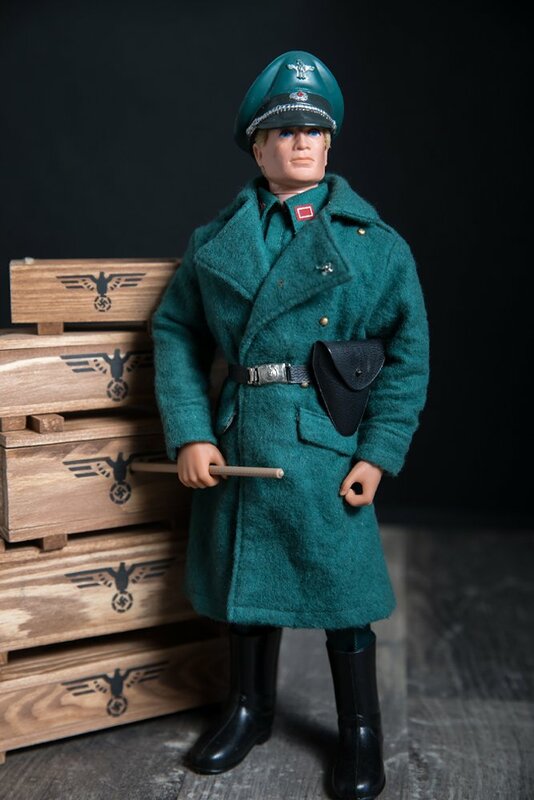 1974, German Staff Officer Part of the Soldiers of the World range came this hugely popular uniform, with unique riding breeches and officers cap with storm goggles made this outfit the perfect enemy for Action Man and is still very popular with collectors today. finding a good colour match between tunic & breeches can prove difficult. 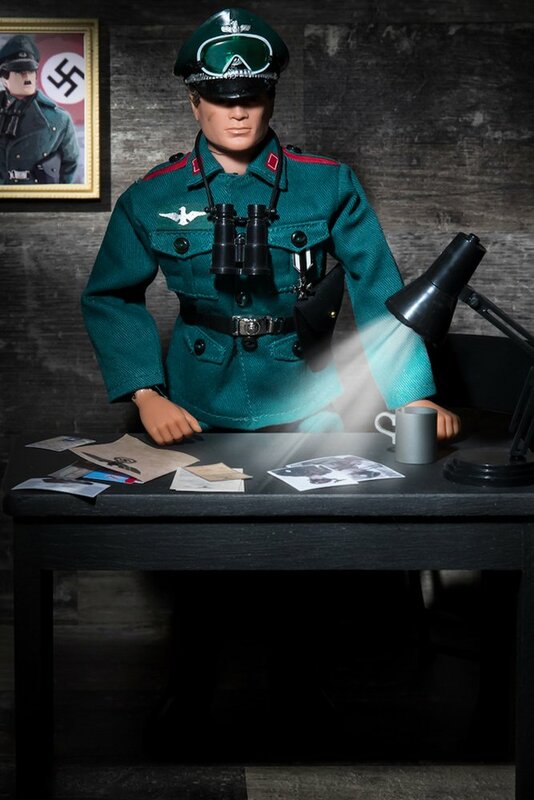 1974, Camp Kommandant, This outfit was the perfect add on to increase the play value for the popular Escape from Colditz set which included a British Escape Officer, German Stormtrooper and sentry box, as with the German Staff officer this outfit is still popular with collectors today. 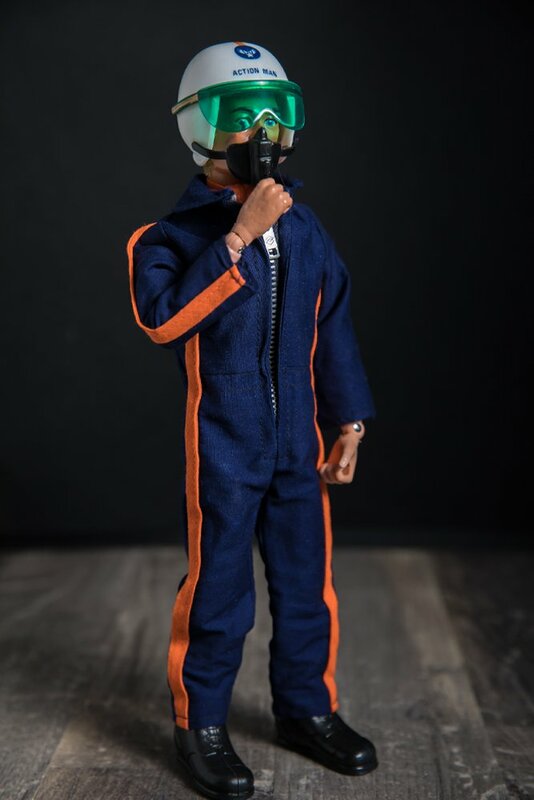 1975, Helicopter Pilot, It goes without saying Palitoy needed a pilot for the Helicopter and any future flying vehicles this was an extremely popular boxed figure because of that very reason and finding mint examples of this outfit is not a problem. 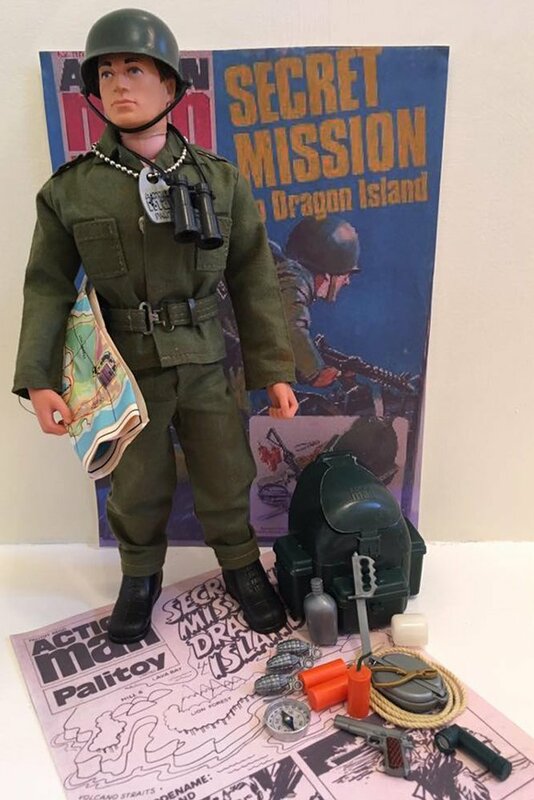 1975, Commando, Based on the Royal Marines Commando units, I always thought it odd that Palitoy issued a M-60 with it. However they did and it was and still is a hugely popular outfit, its beauty lies in it’s basic construction, later versions would see the zipper replaced with poppers, The camo crayon is extremely rare to find so we are awarding stars excluding the crayon, add 2 stars with it. 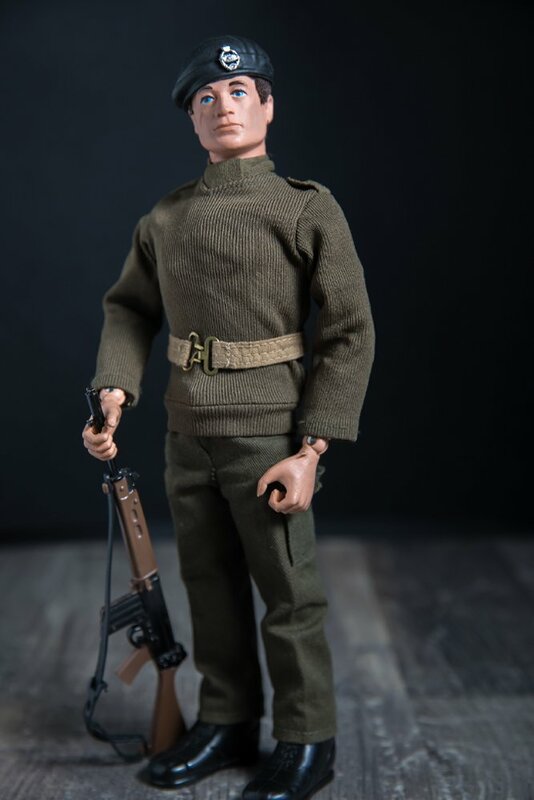 1975, Action Man Soldier, The earlier cloth beret was now replaced with the iconic rubber one sporting the Tank Regiment cap badge, this basic soldier uniform will remain in production with subtle changes throughout the rest of Action Mans production. Every collector has a love relationship with this outfit, probably because we all owned it in our childhoods. due to the numbers sold it is easy to find.